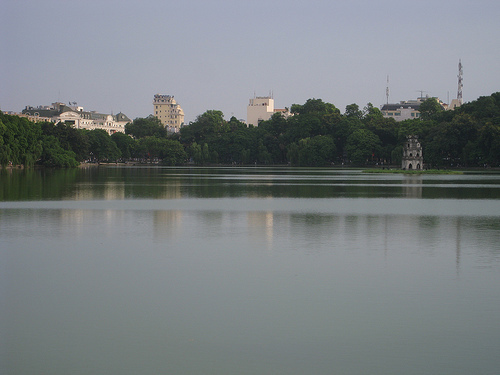 Flying into Hanoi saw my nose pressed firmly against the window, craning to view the Red River in all its glory. With such a bird’s eye view it was possible to see why it had been named ‘Red’, for the earth colours it a rich terracotta. It is a mighty beast, this river, and cannot be trusted. It certainly feeds the agriculture of the region but also floods regularly, causing havoc and destruction. Back on the ground we were soon inside the airport, where we had our first proper taste of Vietnamese bureaucracy whilst waiting for our visas. They’d already been approved through an online visa agency but could only be issued in person, so here we were. A wordless attendant gestured at us to hand over our passports and complete another form, which only replicated information already given through the visa agency. Then he waved us around to the other end of a glass-walled office to pay the 50 USD processing fee and retrieve our passports. Flipping through the pages we checked that they contained our visas, which they did, but with our surnames first and middle names second. I guess they don’t understand how our names work, but in any other country, getting the names muddled could result in the document being rendered invalid. Curious. Next we presented our documents at queue-less immigration counters where surly men in uniforms scowled as they stamped our passports. There was a total lack of welcome. You might be forgiven for feeling like an intruder with first impressions like these, but we were so excited to be in Vietnam, at long last, that we dismissed the grumpiness and looked forward to better experiences elsewhere. Thanks to the time-consuming bureaucracy of immigration, the baggage handlers looked super efficient with all bags waiting for us on the carrousel. Now we just needed cash, so we approached an ATM. There are a lot of zeros involved with the Vietnamese currency, called Vietnamese Dong, so it confused me as I extracted 1.5million Dong, hoping beyond hope that I’d done my calculations correctly and I now held the equivalent of £50.00 in my hand, not £5,000.00 or some other outrageous sum. 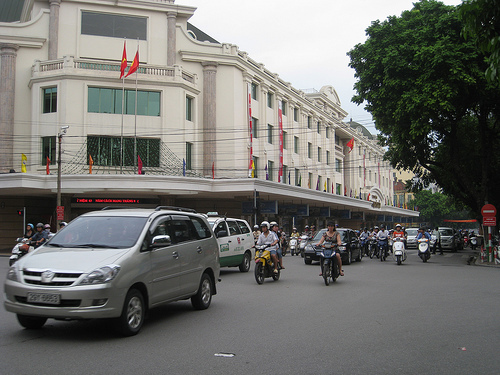 Then we negotiated a cool 270,000 Dong for a taxi to our hotel in central Hanoi. It sounds terrifying, to pay 270,000 in any currency for anything less than a super yacht or piece of property. It was, in fact, equivalent to $16.00 USD and the tariff was government-regulated so the haggling wasn’t really necessary; our driver just tried it on a bit. At the end of the fare he was to receive a nice tip, so bless his Vietnamese cotton socks, he shouldn’t have worried so much at the start. 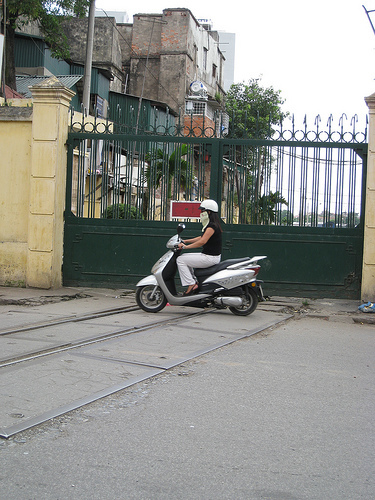 As we left the airport, the road was immediately bumpy with potholes, which are a common issue throughout Vietnam, but I wasn’t interested in how comfortable our ride was; the views around us were attracting my full attention. Not only did the mountains behind us resemble those monochromatic ink-wash paintings found in Chinese restaurants, all around us were women wearing conical hats as they rode their bikes past rice paddies of the sort of vibrant green that tells of fertile land and plenty of precipitation. It was like travelling through an oriental wonderland. Our driver didn’t seem too confident on the road; his brow bore the concentration furrows of a relatively new driver. We soon stopped for petrol at a service station and I watched one of the female attendants who’d tied a bandanna around her face to protect her from the fumes. She watched me back with smiling eyes and when we left, I waved at her. Her eyes lit up and she returned the wave with vigour. This was more like it: some friendly, smiling faces instead of the surliness back at Hanoi Airport. There weren’t many cars on the road; but it was positively teeming with two-wheeled vehicles, and from time to time we spotted a cart being towed along in the traffic by skinny oxen with horns that could do a lot of damage to a car windscreen, should push come to shove. 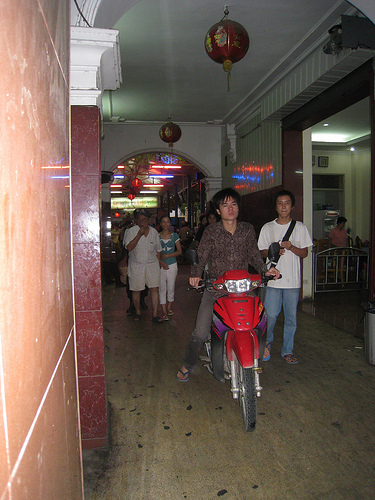 As we drank in our new surrounds, it amazed us how many people could squeeze onto a tiny moped. Whole families, babies included, seemed able to fit on the one seat. Mopeds and motorcycles were the main form of transport here, carrying everything from people to bamboo cages filled with chickens or other animals destined for market or even the odd oven. If that weren’t a balancing act in itself, then the manoeuvres of the moped riders as they weaved daringly through the heavy traffic or drove out of side streets at right angles into the traffic flow without looking made them the equivalent of two-wheeled contortion artists. For these riders, no gap in the traffic was too small, and the air was alive with the honking of horns. This was one busy city and it was easy to think that it might just never slow down. 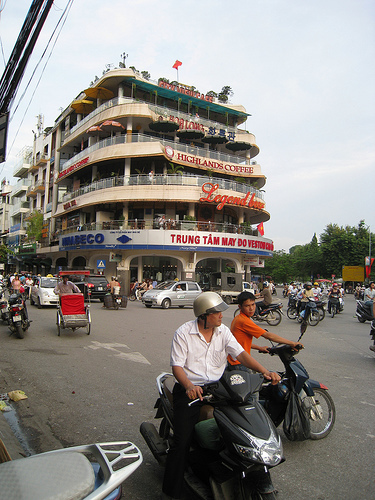 We were now approaching central Hanoi. The houses lining the main thoroughfare on which we were travelling were tall and skinny. Many of them operated businesses from their ground floor room. We saw Pho bars, coffin makers, grocery shops and florists. Hairdressers had the freedom of the footpaths. Intrigued, we noticed that they set up shop by hanging a mirror on a wall and placing a chair for their clients on the footpath. Mounds of shorn hair grew from the ground around the chairs populated by a clientele who seemed perfectly happy to be groomed in public. Vietnam was already full of surprises yet we’d only been here for a short while. In any case, Monsieur and I were happy about that, because different was exactly what we’d signed up for when we decided to visit this fascinating country and different it was certainly proving to be. Previous Post Viet Grill Me!